This deliciously indulgent candy bar by Amy E's Bakery blends dairy-free caramel and toasted cashews, then covers it with decadent dark chocolate and the perfect sprinkling of Himalayan pink salt for the perfect sweet-and-salty flavor combination! Made with organic ingredients and nothing artificial, Amy E's uses Rainforest Alliance Certified vegan chocolate and Fair Trade Certified organic cocoa butter to give you the best ingredients possible. 2 oz. (57g) candy bars are $2.59 each. This is the best candy bar I have had yet. The ratio of each ingredient is perfect. The Carmel is soooooo good and the little bit of salt on the outside just intensifies the flavor. From Anonymous of Columbia, Missouri on 1/7/2019 . From Anonymous of Los Fresnos, Texas on 6/25/2018 . I'm in love with these , they taste very similar to snickers but a bit saltier. Obviously not the same taste , these are better!!! So good. If I had them available locally I'd be a bad example of a vegan. 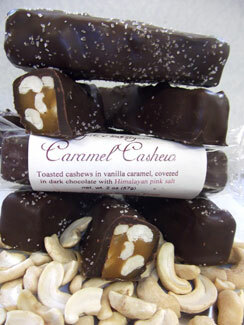 Allergen Contains cashews, coconut and soy. Made in a facility that also processes milk, tree nuts and peanuts in other items made on site.